For over a decade, the district administered the California Healthy Kids Survey annually to report on students’ risk behaviors, including drug and alcohol use. But for Hanson, the survey failed to provide a complete picture of students’ social and emotional well-being, and it lacked relevant data for practitioners to act upon. By the 2011-2012 school year, Fresno Unified had already committed itself to deepening the use of holistic, student-centered approaches. The district implemented the Positive Behavioral Interventions and Supports (PBIS) framework through the use of Safe & Civil Schools. During this time, Fresno Unified’s leaders began collaborating with leaders from Sacramento City Unified and Oakland Unified, sharing best practices and knowledge. This collaboration not only introduced Hanson to SEL measurement and supports, but also formed the basis for a collaboration that would garner national attention in the years ahead—the CORE Districts. 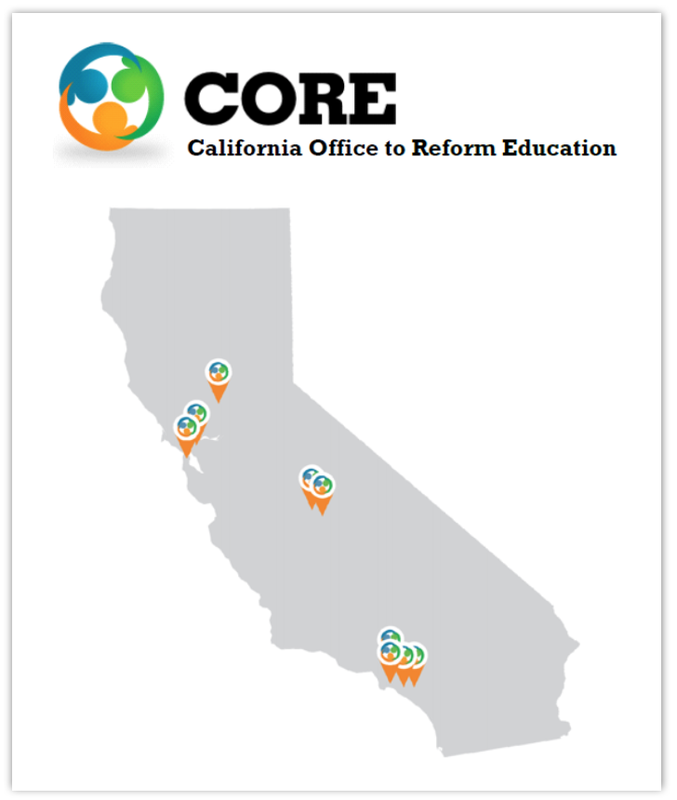 The informal collaboration between leaders of nine of California’s largest school districts—Los Angeles, San Francisco, Sacramento, Oakland, Long Beach, Santa Ana, Sanger, Garden Grove, and Fresno—would become formalized under the California Office of Reform in Education. The mission of the CORE Districts is to “work together to innovate, implement, and scale successful strategies and tools that help our students succeed, so that all student are prepared for college and career.” In all, these districts serve roughly 1 in 5 students across California, supporting over one million students in local districts across the state. The CORE Districts partnered with leading researchers and non-profit organizations, including Angela Duckworth, Transforming Education and Panorama Education, to develop valid and reliable measurement instruments. Fresno Unified and other districts partnered with Panorama to collect and analyze survey data, and to develop interactive SEL reports. Yet Fresno Unified's leaders knew that SEL would only reach students if it was buttressed by robust structures and a culture of collaboration. While the progress was marked, SEL was yet to come to life in the places that matter most for kids: their schools and classrooms. As featured in "Webinar: Improving Social-Emotional Learning With Measurement"
With strong measurement tools and processes in place, the next step was to increase the capacity of Fresno Unified’s central office. If schools were to capitalize on the full potential of the newly available data, they would need both resources and support to bring social-emotional learning to life for students. To build a bridge between the district and its schools, Fresno Unified’s leaders relied upon a professional learning community at every school site. Dubbed the “Climate and Culture Teams,” these small groups represent a cross section of each school and are comprised of teachers, classified staff members (e.g. office staff or campus liaison), and an administrator who actively participates. The teams meet monthly to process and evaluate data related to school climate, attendance, and behavior and to create and track strategic plans for addressing students’ social-emotional and climate needs utilizing the district's Climate and Culture Tier I Implementation Rubric. These teams are also responsible for soliciting staff and student feedback, a critical component for grounding the climate and culture work at every school. In the spring, Climate and Culture Team members are provided access to the results of the district’s SEL and school climate surveys. 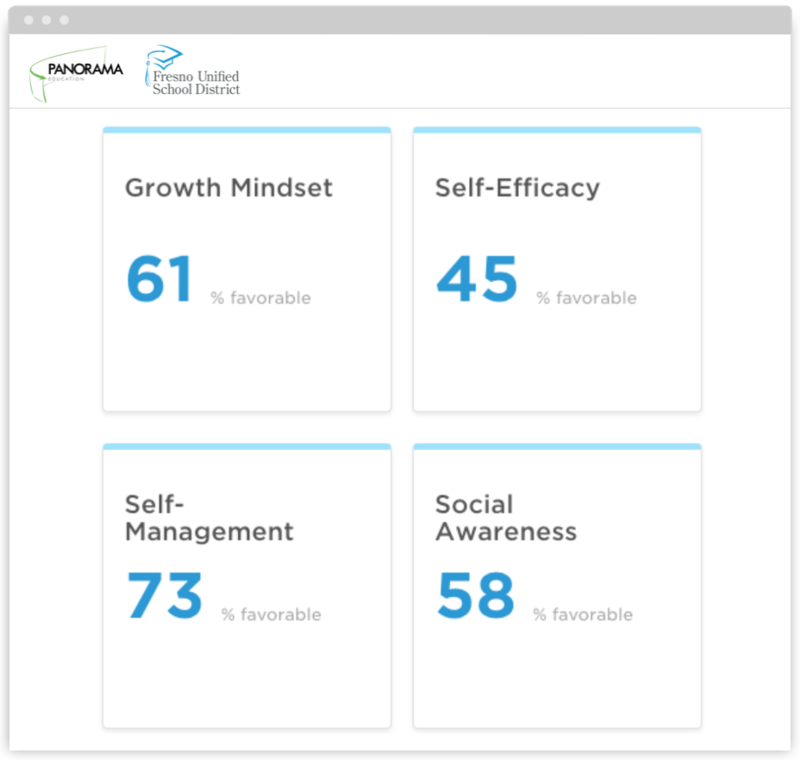 Every team member can log in to view school-wide survey data through Panorama’s online platform, as well as results from every other school in the district. The decision to make available all information from every school site was deliberate, as district leaders sought to build a culture of transparency and peer collaboration. Rita Baharian (Director of Climate and Culture) and Malati Gopal (Analyst) share strategies for developing organizational structures that bring SEL to life. With training from the School Climate Office staff, each team uses Panorama’s data inquiry tools and engage in meaningful discussions based on their observations. This level of shared collaboration supports the district in developing a culture of shared responsibility that promotes a positive climate and culture at every school site. In doing so, Baharian and her colleagues seek to identify the necessary conditions for scaling SEL practices that will make an impact for students in the classroom. By seeding a grassroots movement for SEL in the district, leaders in Fresno Unified have empowered teachers to become internal champions. 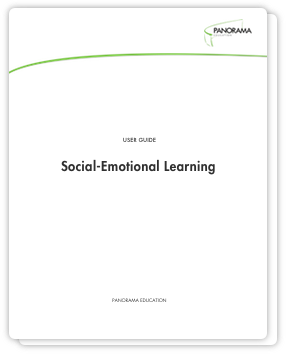 For the past three years, Fresno Unified has partnered with Panorama Education to deliver actionable data reports about social-emotional learning and school climate to school and district leaders. In order to facilitate positive change in each of its school sites, district leaders recognized the need to continue delivering actionable data to its school teams. Accordingly, district leaders worked closely with Panorama to deliver SEL data reports directly to school leaders. To Wulf and other principals in Fresno Unified, this level of collaboration is made possible by the district leadership’s decision to share all school-level results across the district. As a result, Wulf noticed a culture of openness and support: “We're able to have very productive, honest conversations that are free of judgment,” says Wulf. With direct access to survey results, principals also use SEL data to craft a Single Plan for Student Achievement at every school site. This annual school-level plan organizes educators to identify their school’s areas for growth, including those in SEL and climate domains, that align with the district’s strategic goals. In doing so, the data has gained traction as a key indicator for school-level progress, as educators are equipped with the necessary tools to make and validate changes in practice on their own terms. Brian Wulf (Principal) explains how he collaborates with peers using data from Panorama's reports to continue building a positive school climate that supports each student's needs. Principal Wulf’s perspective illuminates the product of years of work: a culture that promotes peer learning, shared accountability, and a growth mindset. It is this culture that holds the greatest potential for delivering on the social and emotional needs of students in Fresno Unified. 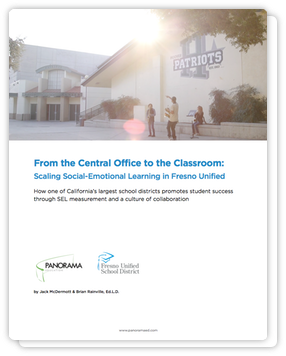 By committing to a deeply-held belief system that includes measurement, collaboration around data, and support at every level, Fresno Unified’s leaders have successfully brought SEL to a place of sustainability and impact for students in the district. Ashley Trippel (School Psychologist) describes how she uses data in Panorama to support students and staff members within the PBIS framework in Fresno Unified. 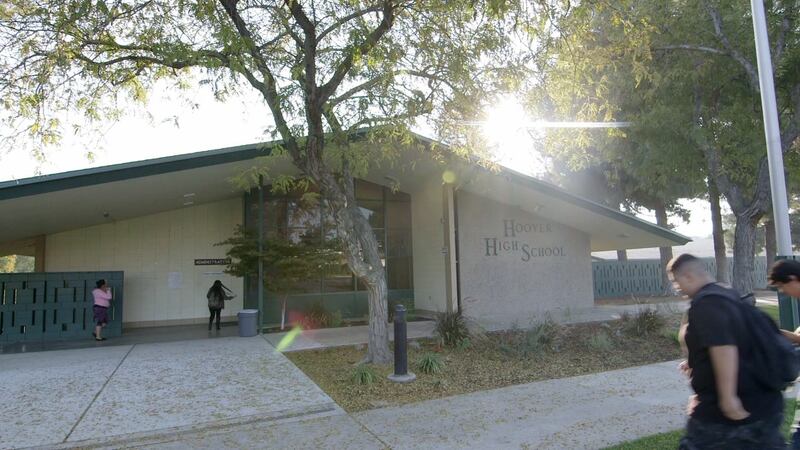 Today, Fresno Unified School District has put a flashlight on students’ SEL. By supporting teachers and staff in schools, defining new organizational structures, and developing powerful measurements and data sharing systems, the district has created the foundation for SEL to flourish for its 74,000 students. 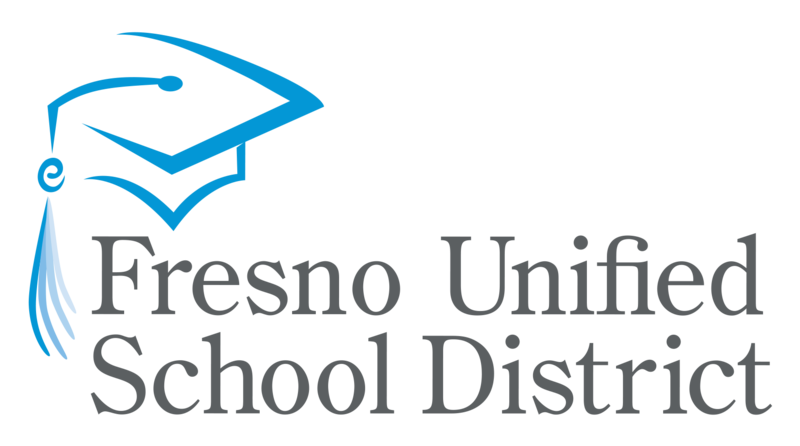 While there is still much progress to be made, Fresno Unified has realized signs of success; most recently, the district announced that its schools achieved an 83.8% graduation rate, the highest rate in the district’s history. This figure reflects gains of over 14 percentage points in the past six years, besting both the state and national averages with meaningful progress towards closing gaps between student groups. Fresno Unified and other members of the CORE Districts have led the nation in promoting students' social-emotional learning skills in school and beyond. Every school receives access to SEL data for their students and all other schools in the district, allowing for holistic goal-setting. The district has created new roles for teachers on special assignment and developed professional learning opportunities focused on SEL. Every school in Fresno Unified has a "Climate and Culture Team" that meets monthly to review data, create action plans, and implement strategies for improvement. With measurements that align to its five-year strategic goals, the district has created a sustainable, coherent system for change. 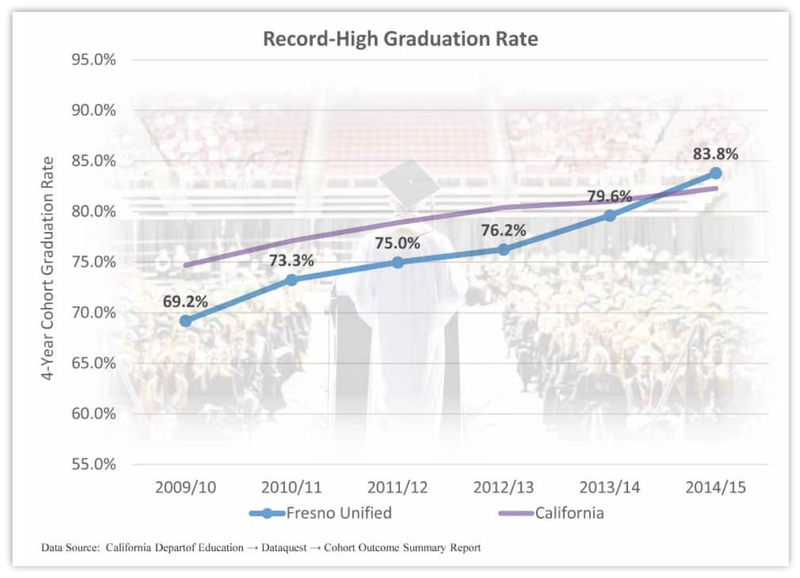 Fresno Unified has reached an 83.8% graduation rate, its highest ever, and has realized success in supporting every student's social and emotional needs.